With the first arc of the new Amazing Spider-Man title ending with such a resounding thud last month, it was going to take a pretty extraordinary effort from Dan Slott and Gisueppe Camuncoli in this week’s Amazing Spider-Man #7 to restore my full faith and confidence in the direction of the book moving forward. I know that sounds uncharacteristically negative coming from me, but if you count the final “Goblin Nation” arc from Superior Spider-Man earlier this year, we have to go as far back as almost a year ago since I last found a Spidey book storyline to be well told, from start to finish. ASM #7 is a small step in the right direction, but hardly enough for me to declare that all of the ills in terms of characterization and plot development of the previous dozen or so Spider-Man comics have been remedied. Of course, part of that lack of progress is due primarily to the nature of the story Slott and Camuncoli are telling here. 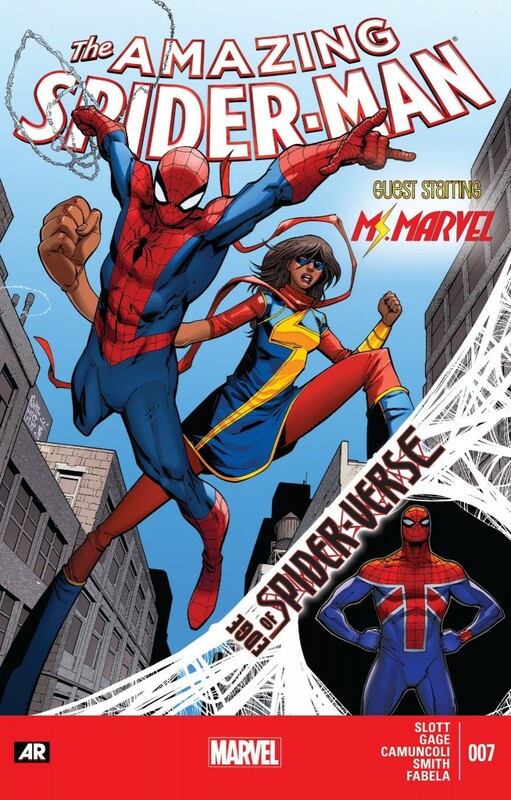 Similar to the old Marvel Team-Up stories from yesteryear, ASM #7, and assumedly its sequel, ASM #8, which will publish later this month, is more of a vehicle for Marvel to promote one of its newer characters, the Kamala Khan iteration of Ms. Marvel, and to try attract more readers to a book that is critically well received, but appears to be struggling commercially (i.e., sales aren’t great). There’s absolutely nothing wrong with Marvel trying to use one of its more popular characters to push its collective wares – though in an ideal world, that’s what “B” books like a team-up comic were always for, since it then won’t distract from the larger story arc transpiring in the “main” ASM series. As such, between the heavy focus on Ms. Marvel, and the comic’s back-up story that serves as prelude to “Spider-Verse,” readers are left with another issue of ASM where Peter/Spider-Man is not the starring attraction. It continues to be a very bizarre trend being put forward by Slott and Marvel, and I’m not sure what I’m supposed to make of it. As someone who pulls a handful of other titles, I’m rarely wondering to myself why I’m not seeing more of Daredevil or Rocket Raccoon after I read their solo books like I am with Spider-Man the past few months. And as a double bonus, the attention that is paid to Peter in this comic is a bit off-handed in its tone. Ever since Peter’s return, there’s been a somewhat inexplicable aversion by the creative team to fully explore the impacts of Doc Ock’s time in control of Peter’s body and life. Spider-book editor Nick Lowe recently said that there wasn’t any plan to explore Peter’s guilt over what transpired when he was out-of-body, but that’s not really what I was thinking would be addressed any way. 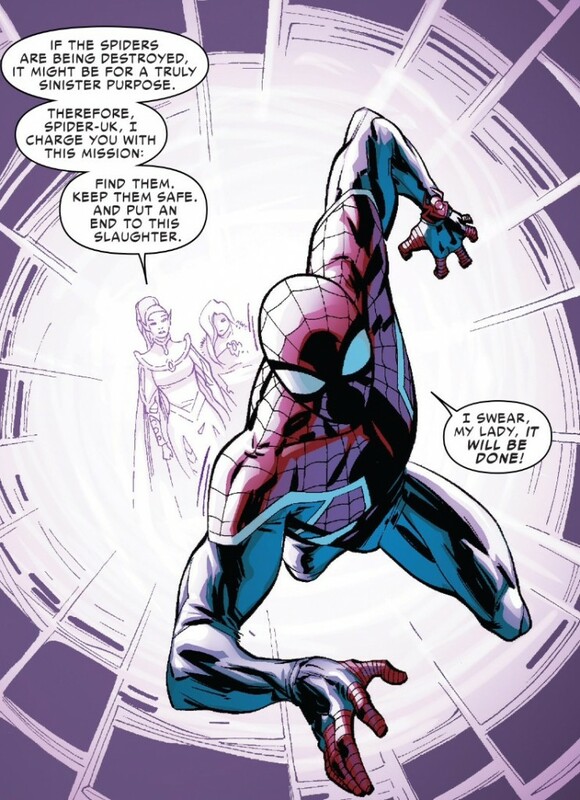 In Amazing Spider-Man #700, Peter was essentially “killed” by his arch nemesis, who then went about carrying on his “legacy” as Spider-Man in a very different way. Peter then had to “fight” his way back to his body, though that reunion didn’t actually happen until Otto relinquished control. While this scenario is total comic book fantasy, it’s still a fairly traumatic experience, even by traditional medium standards. Because of that, I was looking forward to seeing what Peter learned from the whole thing – whether it’s about himself or how he wants to continue to be a hero. Instead, through the first six issues of ASM volume three, Peter seems to be back to acting a fool, and showing little to no reflection on what put him in the superior switch-out in the first place. ASM #7 starts to address this idea – ever so slightly. Anna talks to Peter about his unrealistic, and frankly egotistical desire to save everyone in New York City all the time. She rightly points out that Peter is running his own company now, and that there are many people who rely on him to be a more than functional leader. But the ultimate message that can be inferred from Anna Maria’s talk with Peter is that Otto’s methods of not sweating the small stuff and only handling the “big stuff,” were more effective. Peter does get to point out that Otto’s nonchalance about petty crime is what ultimately fed into the rise of “Goblin Nation,” but even with this counter, the larger point Slott is making with this sequence is still not what I had in mind in terms of having Spider-Man deal with the fallout and ramifications of the “Superior” era. To be blunt, I’m long past the point of interest in talking about how “great” Otto Octavius was as Spider-Man – regardless of where this debate actually ends. I think in even having this conversation, it only further glosses over Otto’s crimes (he KILLED Peter Parker to become him – MURDERED him) in an effort to play into this meme that when Superior ended in April, the fans were just BEGGING to have him back. When in effect what fans liked was the story that Superior told and the way Slott writes the character (which I will readily admit, is more enjoyable than how he currently writes Peter). Again, what did Peter learn from his time in the astral plane? Will he be more methodical in how he reacts going forward, or will he continue to leap into action without a second thought. There are kernels of this debate in what Anna Maria says to Peter here, but still not enough for me to think we’re going to witness any actual change or evolution in Spidey’s characterization. One thing that Slott does accomplish in this Peter/Anna Maria scene is the removal of Cindy Moon, aka, Silk from this already borderline wacky sitcom living situation (I hear NBC already sees the potential of a show about a superhero living with a woman who dated another man sharing his body, while another woman, who the hero is mystically attracted to, also lives in the apartment – it could totally be the new Friends). 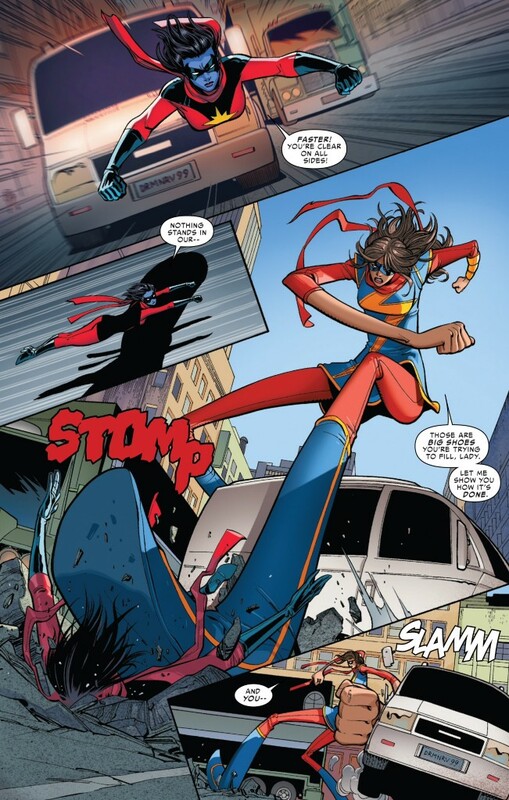 Silk is very clearly going to have her own role to play in “Spider-Verse” going forward, and I don’t actually think the character has left (or should leave) the larger Spider-Man story, but the gimmick of Peter and Cindy being unable to control themselves around each other was getting old fast. Plus, anything that puts the focus more on Peter in his own book, is a development I favor. So if Cindy wants to live in Greenpoint or Williamsburg (why do I default to Brooklyn?) with a bunch of Fact Channel interns, more power to her. The actual Spider-Man/Ms. Marvel team-up narrative is harmless enough, as it hits all the spots a team-up story of this nature: 1) non-Spider-Man hero is introduced with a bit of exposition which explains his/her powers; 2) Villain more often associated with non-Spider-Man hero causes some trouble; 3) Spider-Man and hero meet, introduce themselves, share a laugh or two; 4) Spider-Man and hero fight villain together. But it’s also patently obvious from how this story is constructed that ASM #7 is your typical “cool down” or “calm before the storm” issue before “Spider-Verse” kicks off. As such, from an actual plot development standpoint, I was a bit more keyed in on ASM #7’s backup story, which features a Captain Britain iteration of Spider-Man, and the death of a couple of Spider-characters from the Saturday morning cartoon universe (and given how we just recently had our first Saturday in decades without Saturday morning cartoons, how apropos of Slott/Marvel). The “B” story here continues the fine job Slott is doing in establishing just how threatening Morlun and his totem-collecting cohorts are to Spider-Man and all of his iterations. And while the constant deaths and murders of all these Multiverse Spider-Men is feeling a tad played out, I also can’t help but think that from the get-go, “Spider-Verse” has been designed to be the Spider-Man world’s version of Crisis on the Infinite Earths, which was used to clean up and better streamline DC’s multiverse. 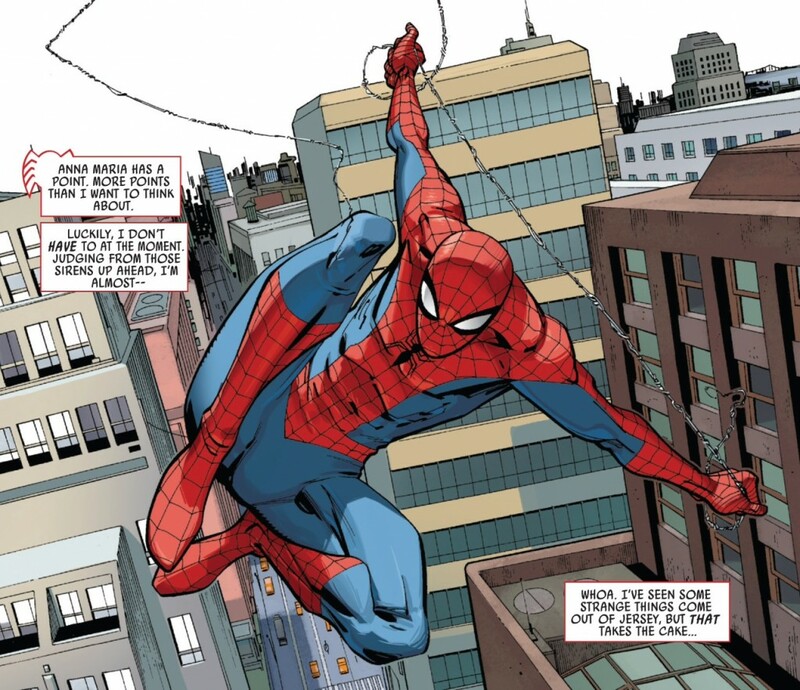 I don’t find anything wrong with that endgame, as long the mainstream 616 universe continues to have a strong and positive Spider-Man presence for the foreseeable future. Given the fact that she’s been outselling almost everything else since her introduction, I don’t think promoting her book for sales reasons is the reason why Ms. Marvel got to be with Spidey for the issue. The book has been in the bottom third of the Diamond sales since May and didn’t even crack the top 100 in July or August. I’m not baselessly knocking the book but I don’t know where your numbers are coming from. I do know that her book is the best selling Marvel digital book every month by a significant number. I dropped ASM after the end of Superior Spider-Man (except for the “Learning to Crawl” mini-series – which despite the dumb numbering scheme was exactly that, a mini-series – and a pretty good one at that). But I have been considering getting this issue b/c Ms. Marvel is my current favorite Marvel book. I had not heard that her book was suffering poor sales until now, but that relaly worries me. I don’t know if you read it, but not only is the art fantastic, but the characters are interesting and the pace is very similar to the Bronze Age comics I liked as a kid (i.e. lots of stuff seems to happen each issue, it isn’t decompressed to a hell where only Brian Michael Bendis writes comics – I think that is the 6th circle of Hades). I just discovered your website by reading your post on the end of your chase (congrats!). I am a huge fan of Spider-Man and I am somehow happy to see that another big fan like you does not appreciate the most recent stories. While I enjoy the creativity of Dan Slott, I think he is mischaracterizing Spider-Man and the rest of the cast. The voice does not sound right every time I read one of the recent Spidey comic books. i am yelling at this comic every time i read it, i was SO excited seeing Peter dealing with the whole Superior thing, I had visions of Kraven’s Last Hunt when he comes out of the grave, i WANTED that moment so bad, instead we have Otto just give up, a fight Peter didn’t win, but a life OTTO gave back to him, then he is back t his old self right away? I am essentially buying this title out of habit, i wouldn’t stand for it with any other title…. I couldn’t agree more. Issue #7 was strange to say the least. I do believe that Slott did the plot to the story and Gage scripted the story. I’m not sure if that means anything.